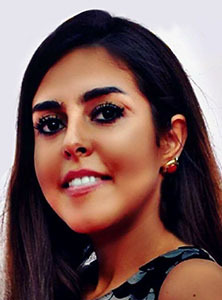 Aliyaa Al Faour is a student of fashion design at the American University in the Emirates (AUE). Her style is simple and modern. Her license to the fashion world is her love for art and design. With encouragement from her family, Aliyaa was given a task to make her sister’s beautiful wedding gown. since then, Aliyaa decided to start a career in fashion. She is part of the Sheikh Zayed fashion awards.